Ekkerøy is a traditional fishing village on the northern shore of the Varanger fjord in Eastern Finnmark, Norway. The village is situated 15 km east of the town of Vadsø, a short detour from the main road to Vardø and Hamningberg. The suffix -øy in Ekkerøy means island in Norwegian, and in old times it was a true island and not as today: a peninsula. 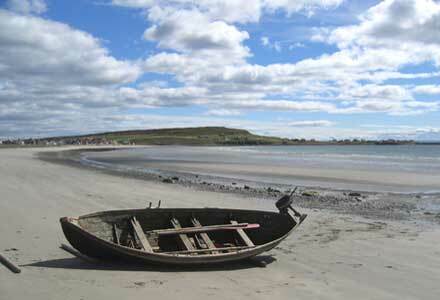 Then, when the sea had its low water, the villagers could walk dryshod over to the mainland. Gradually, the nature made a broad tongue of land and a fine sand beach on each side of it. You are able to see huge fish drying racks, where earlier the codfish was hung to make the very best quality of dried fish. Dried fish is still popular for the Italian, Spanish and Portuguese kitchen, to cook bacalao. Earlier the fishermen delivered their catch to the two fish buyers and village shopkeepers. The times have changed, the buildings from one of the buyers - Kjeldsen - has been restored and is now a museum with its fishing pier, a steam house were cod-liver oil was produced, an old shop and a lot of old fishing tools. One of the buildings to the other buyer - Amundsen - is reconstructed into a summer restaurant, called Havhesten (sea horse) ! Havhesten is situated out on the nearest fishing peer,when arriving at the end of the road to Ekkerøy. Through the glass walls you have a panorama view towards the harbour and the village. And further, you can see the open and wide horizon, which is typical for the Varanger peninsula. In the summer time you can enjoy a delicious meal made from fish or meat from the region, and wine as well.